Hermann Rorschach, Swiss psychiatrist, born in 1884 in Zurich. His father was a painter and Hermann considered the same career before he made up his mind for psychiatry, which he learnt at Eugen Bleuler´s clinic in Zurich. Hermann Rorschach mainly worked in Switzerland but also in Russia, where he had many scientific contacts. His wife Olga, also a physician, was of Russian origin. Hermann Rorschach took a deep interest in psychoanalysis, and during the 1910´s he published several psychoanalytic articles. Already in 1911 he had begun experimenting with the interpretation of ink blots. He was not the first one who did this; among his famous forerunners are Leonardo da Vinci and Justinus Kerner. In 1919, Rorschach again took up serious studies of this field — the result was the book which you see here to the right, the Psychodiagnostik(1921). This work is nowadays regarded as one of the great classics of psychiatry and psychology, but Hermann Rorschach himself never experienced any success with it. He had difficulties finding a publisher for it, and it was not well received when it finally came out. Hermann Rorschach, with Eugen Bleuler´s words "the hope for a whole generation of Swiss psychiatry", died on the 2d of April, 1922, from the complications of an appendicitis. Ellenberger, H., The Life and Work of Hermann Rorschach (1884-1922). Bulletin of the Menninger Clinic, 18 (1954), 172-219. Reprinted many times; e.g. in Beyond the Unconscious. Essays of Henri F. Ellenberger in the history of psychiatry (ed. M. Micale, Princeton UP 1993), 192-236. 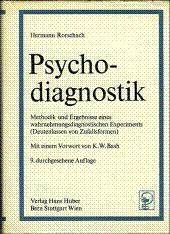 Rorschach, H.,Psychodiagnostik (Bircher, Bern 1921; later editions are Huber, Bern, including the English translation, Psychodiagnostics).